When: Saturday, January 9th, 2016. Site opens at 10am. The gate will close at 2pm. The event ends and the site closes at 10pm. Come One Come All to the Celebration of Saturnalia with our Most August Imperiatori, Tindal and Etain, featuring the renown competition for Sylvan Bard of Æthelmearc. 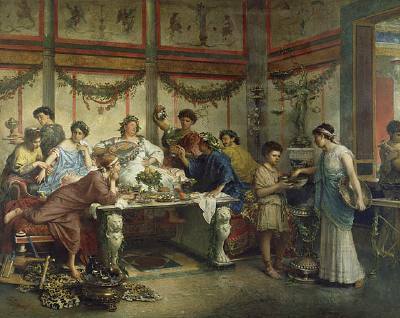 Keep your strength up for reveling by partaking of the splendid lunch presented by Baron Janos Mezzaros, and after a day full of activities, you may choose to sit Above the Salt or Below the Salt for a Saturnalia Feast also created by Janos and his Company of Cooks. You may choose your entertainment throughout the day: dancing (Instruction during the day and dance in the evening), an arts contest with roots going back to the the days of Cicero (more info to come), games of chance (including a Kingdom fundraiser) and games of skill. Come in your most brilliantly-hued haute couture. As did our ancestors, we too will revel in the Roman fashion. There will be a Kings Choice and Queens Choice for best dressed in Saternalia sartorial splendor. And as the Sun turns, so too shall our social order, and as befits our celebration, our Lord and Lady of Misrule too shall make their choices known. Other activities and information will be forthcoming on the web and on the Kingdom and Twelfth Night Facebook pages as well as here in the Æstel. Autocrats for your event are Lady Antoinette de Lorraine (Ashley Green, antoinettedelorraine@gmail.com, 570-317-4575 – before 7pm) and Mistress Cori (Clare Jackson, thecoribird@gmail.com, 716-517-8570 TEXT is best). Please send reservations to Edith of Winterton (Caroline Elliott, 38 Chateau Terrace EAST, Amherst, NY 14226, edithofwinterton@gmail.com, 716-574-1354). Please include an email with your reservation for followup. Please include any food allergies when you make your reservation. For Children age 0-12 there will be an alternate Children’s Feast available at a children’s table in the feast hall for $3.00. For those whose minor children do not eat event dinners at all, parents may reserve for them with site fee only. We will have a table in the feast hall for kids who are not partaking any feast whose parents are, so that the kids may still be in line of sight without taking a feast seat. Off board tables will be available for people who wish to stay at the event and bring their own feast. Please make your checks payable to: SCA NY, Inc- Canton of Beau Fleuve. A $5.00 non-member surcharge will be collected at the door from all non-member adults.